The word ‘periodontal’ means “around the tooth”. Periodontal disease attacks the gums and the bone that support the teeth. Plaque is a sticky film of food debris, bacteria, and saliva. If plaque is not removed, it turns into calculus (tartar). 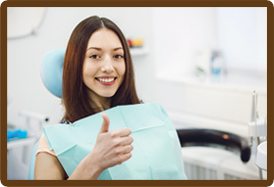 When plaque and calculus are not removed, they begin to destroy the gums and bone. Periodontal disease is characterized by red, swollen, and bleeding gums. Not only is it the number one reason for tooth loss, research suggests that there is a link between periodontal disease and other diseases such as, stroke, bacterial pneumonia, diabetes, cardiovascular disease, and increased risk during pregnancy. Smoking also increases the risk of developing periodontal disease. Good oral hygiene, a balanced diet, and regular visits with Dr. Trujillo and her team can help reduce your risk of developing periodontal disease. A change in spacing between teeth – Caused by bone loss. Clenching/Grinding teeth – The clenching or grinding of the teeth can significantly damage the supporting tissue surrounding the teeth. Grinding one’s teeth is usually associated with a “bad bite” or the misalignment of the teeth. When an individual is suffering from gum disease, the additional destruction of gingival tissue due to grinding can accelerate the progression of the disease. Our hygienists can perform effective cleaning procedures in deep pockets such as scaling and root planing, and Dr. Trujillo can prescribe antibiotic and antifungal medications to treat infection and halt the progression of the disease, if necessary. Gingivitis is the inflammation of the gums. It is caused by the toxins in plaque and can lead to periodontal disease. People at increased risk of developing gingivitis include tobacco users, pregnant women, women taking birth control pills, people with uncontrolled diabetes, steroid users and people who take medications to control seizures and blood pressure. 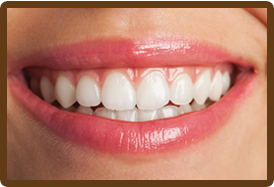 Treatment: Gingivitis is reversible using a solid combination of effective home care and professional cleaning. Chronic periodontal disease is characterized by inflammation below the gum line and the progressive destruction of the gingival and bone tissue. It may appear that the teeth are gradually growing in length, but in actuality the gums are gradually receding. Treatment: Unfortunately unlike gingivitis, chronic periodontal disease cannot be completely cured because the supportive tissue cannot be rebuilt. However, Dr. Trujillo can halt the progression of the disease using scaling and root planing (SRP) procedures in combination with antimicrobial treatments. 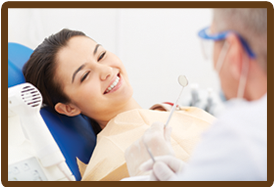 TRU Dental also uses laser therapy in the treatment of periodontal disease. Treatment: Initially, the medical condition which caused the onset of periodontal disease must be controlled. Dr. Trujillo & her hygiene team will halt the progression of the disease using the same treatments used for controlling aggressive and chronic periodontal disease. This form of the disease rapidly worsens and is more prevalent among people who suffer from HIV, immunosuppression, malnutrition, chronic stress or choose to smoke. Tissue death (necrosis) frequently affects the structures that support the teeth. Treatment: Necrotizing periodontal disease is extremely rare. Because it may be associated with HIV or another serious medical condition, it is likely the dentist will consult with a physician before commencing treatment. Scaling, root planing, antibiotic pills, medicated mouth wash and sometimes fungicidal medicines are generally used to treat this form of the disease. If you have any question or concerns about the different types of periodontal disease and treatments, please ask Dr. Trujillo. It is of great importance to halt the progression of periodontal disease before it causes further damage to the gum tissues and jawbone. Dr. Trujillo will initially assess the whole mouth in order to ascertain the progress of the disease. When a diagnosis has been made, Dr. Trujillo and her team may treat the bacterial infection with antibiotics in conjunction with nonsurgical treatment. In the case of moderate periodontal disease, the pockets (under the gumline) of the teeth will be completely cleared of debris using a procedure called scaling and root planing. The pockets may be filled with antibiotics to promote good healing and kill any bacteria that remain and Laser Therapy can also be used to decontaminate the treated area after the scaling and root planing. If you have any further questions about the signs and symptoms of periodontal disease, please ask Dr. Trujillo and her team.